It’s hard to believe it’s been a week since the season started. This Fall has been packed with interesting prospects thus far, and today was, oddly for a Tuesday, no exception. Though of course not all prospects play out the way you expect them to; that’s what makes air week so much fun. I’ve talked before about the difference between low-budget art that is the right choice for a scene and lazy presentation. I mention this now because, while many anime decried as lazy are not, BlazBlue is a true example of the latter; it actually used an incredibly obnoxious fade-to-black deal for most of its transitions, and at least two scenes were just one or two character poses pasted over a one-color background. 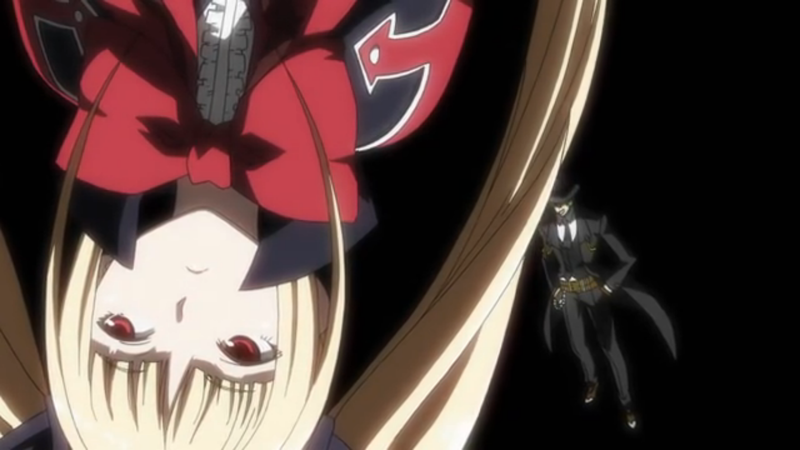 I wasn’t expecting a ton from BlazBlue as a game->anime adaptation, but I figured it had a puncher’s chance of at least being a fun action show. While the fight scenes themselves were alright, and the characters seem like a group that might be worth following, the pacing of the show was out-and-out chop suey, and the director (who apparently only has H2O to his credit prior to this show) didn’t hit any kind of workable rhythm. I don’t see a future in a show with visuals this unbalanced. Dropped. Tokyo Ravens, on the other hand, was something I had pegged as a bit of a potential sleeper hit. And it didn’t disappoint; I fell in love with the whole package. The main character is generic, but in that way that will make him workable within a larger cast as he grows into the role, the side characters have distinguishing features and the female lead is extremely charming (interesting that they decided to go with the Gargantia couple for both lead roles). The pacing felt very natural, laying out key points in a way that was both nice-looking and easy to follow. I really ended up sucked into the story, which is vintage mid-major stuff. It’s getting 4 more episodes, and the best odds to have an awesome episode on Halloween week. This entry was posted in Anime and tagged Anime, BlazBlue, Fall 2013, Sell Me in 20 Minutes, Tokyo Ravens by torisunanohokori. Bookmark the permalink. Yeah, most game to anime releases tend to be poo. There are however exceptions. I enjoyed Gungrave and Persona 4 for example. Games tend to be tricky to adapt, since you’re losing player control that makes a lot of otherwise-tough-to-justify things acceptable. Taken in aggregate, they’re sort of the anti-KMA/SMA manga; inconsistent and highly dependent on how good the people making it are. The good adaptations there are are generally thanks to having good studio/staff teams on the job; nowhere is that more observable than in the contrast between the 2002 (Toei) and 2006 (Kyoto Animation).